Cut the stems from the chard. Cut the stems crosswise into 1/4-inch-thick pieces and set aside. Stack the leaves and cut into 1-inch pieces; keep separate from the stems. Thinly slice the scallions. Heat the oil in a large frying pan over medium heat until shimmering. Add the scallions and chard stems, season with salt and pepper, and cook, stirring occasionally, until softened, about 8 minutes. Add the chard leaves, season with salt, and cook, stirring occasionally, until completely wilted, about 6 minutes. Transfer the mixture to a fine-mesh strainer set over a bowl. Place in the refrigerator and stir occasionally until cooled to room temperature, about 20 minutes. Meanwhile, arrange a rack in the middle of the oven and heat to 400°F. Brush the sides and tube of a 10-cup Bundt pan with melted butter; set aside. When the chard mixture is cooled, pick it up by the handful, squeeze out the excess moisture, and place on a cutting board. Finely chop the mixture, then transfer it to a large bowl. Add the eggs, feta, and dill, and mix to combine. Lay one sheet of phyllo on a work surface, positioning a long end to face you. (Don't worry if the phyllo rips — just patch it back together.) Keep the remaining phyllo covered with plastic wrap, wax paper, or a damp kitchen towel. Brush the phyllo with a thin layer of melted butter. Repeat with the layers of phyllo, brushing each layer, until all the phyllo is used up, making sure to brush the top layer of phyllo with butter. (Rewarm the butter as needed to be able to brush a thin layer.) Season the surface of the phyllo with salt and pepper. 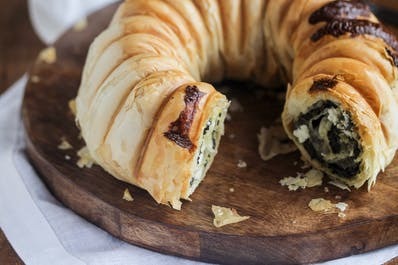 Spread the chard mixture thinly on the phyllo, leaving a one-inch border. Starting from the end closest to you, roll the phyllo tightly up like a jelly roll. Brush the entire outside of the roll with butter. Pick up the roll and place it seam-side up in the Bundt pan, winding it around the tube and making the ends meet. Bake until flaky and golden-brown, about 40 minutes. Immediately flip it out onto a wire cooling rack set over a baking sheet. Let cool 10 minutes. Transfer to a cutting board and cut into 12 slices with a serrated knife. Phyllo: Defrost frozen phyllo dough overnight in the refrigerator. Storage: Leftovers can be stored in an airtight container for up to 5 days. Reheated in a 300°F oven until warmed through, 10 to 12 minutes. And isn’t this pretty? 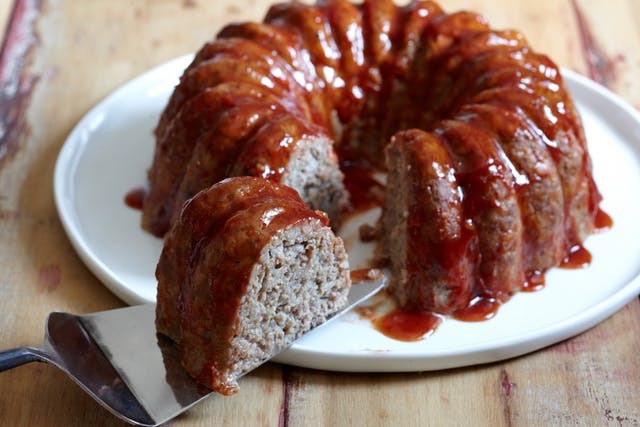 Next time you plan meatloaf for dinner, be sure to bake it in your Bundt pan. This presentation is lovely enough for a dinner party! Arrange a rack in the middle of the oven and heat to 375°F. Meanwhile, bring a large pot of salted water to a boil. 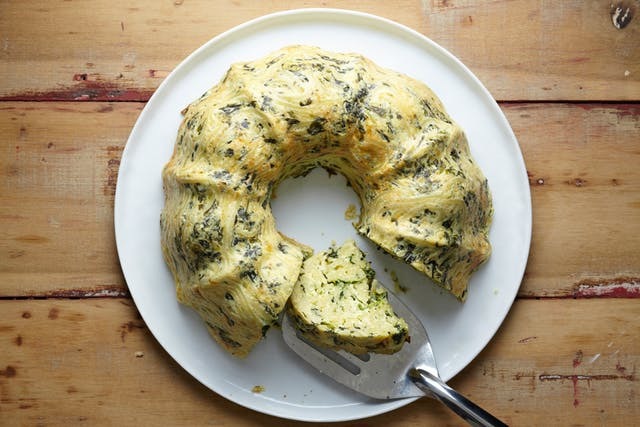 Coat the sides and tube of a 12-cup Bundt pan with cooking spray and set aside. Add the spaghetti to the boiling water and cook until almost tender. Meanwhile, mix the remaining filling ingredients. 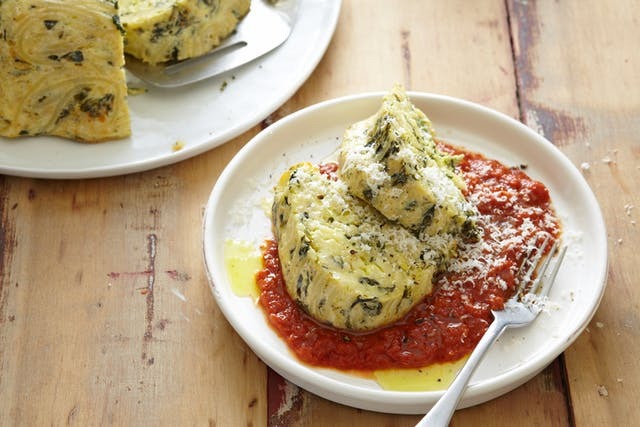 Place the eggs, ricotta, milk, salt, and pepper in a large bowl and whisk until smooth and combined. Using your hands, squeeze the excess water from the thawed spinach and add to the egg mixture. Add the mozzarella, Parmesan, and basil, and stir to combine. When the spaghetti is ready, drain and return to the pot. Immediately add the spinach mixture and mix with tongs to thoroughly combine. Transfer to the Bundt pan and spread into an even layer. Bake until set and golden-brown around the edges, 45 to 55 minutes. Remove the pan to a wire rack and let sit 5 minutes. Meanwhile, warm the marinara sauce in the microwave or on the stovetop. Run a thin knife on the edges of the pasta to loosen. 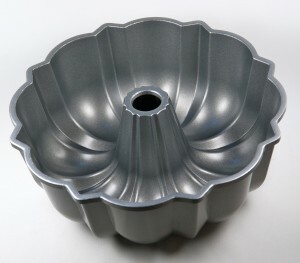 Invert a large plate over the Bundt pan. Holding onto the plate and the pan at the same time (use oven mitts or a towel — it's hot! ), flip it over. Remove the Bundt pan. Cut the Bundt pasta into slices and serve with the marinara sauce. 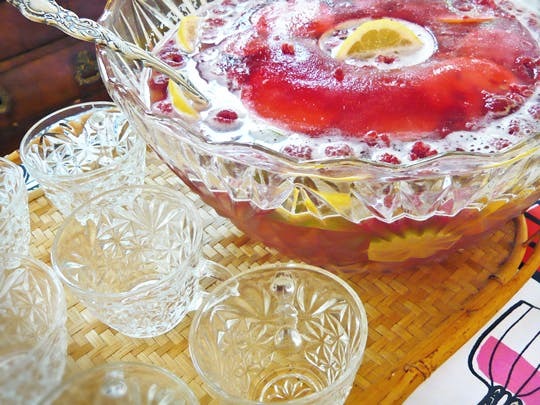 Finally, Kelli’s idea #5: the Bundt pan is perfect for creating beautiful punch bowl ice rings. Fill it with fresh fruit such as raspberries or blackberries, sliced pineapple, or sliced citrus, or even whole spices like cinnamon sticks and star anise for a pop of color and a hint of flavor. Large ice rings can stand the test of time in a punch bowl—they just won't melt nearly as quickly as regular cubes. In closing, I thought I’d just add a note about cleaning the Bundt pan. It can be a pain in the neck. THE secret (and no rocket science here) is to soak it well, meaning for a long time. And this means soaking before you put it in the dishwasher. A long soak takes care of every last little hidden crumb!